Still paying retail and missing out on gold's $60bn-per-day wholesale deals...? THERE'S BEEN A LOT of wild commentary doing the rounds lately about gold and silver prices. I can't vouch for the silver market – small, tight and dependent on fast-ailing industrial-demand as it is. But for Gold Bullion, this sensational "analysis" mistakes the basics of how the gold market works. First it confused a surge in gold-coin prices for a surge in the price of gold itself. Then it confused dealing in physical and paper Gold Futures, by ignoring the world's very largest, deepest and most heavily traded gold market. How so? By the start of 2008, Gold Prices the world over had been steadily climbing for more than six years. A growing handful of people were already invested, with the very earliest gold buyers tripling their money and more since the turn of the decade. Come July of last year – and driven by the sharp drop in prices from March's all-time dollar-highs above $1,000 an ounce – many of these existing gold owners, especially coin buyers, snapped up more gold as the world economy slowed and financial markets went into tailspin. But the leading metals refineries weren't expecting a rush until the usual autumn-time spree. (You can see the typical impact of India's October Gold Buying here...). That caught the big gold-coin mints napping as well. So their clients – meaning your local coin shop – hit a genuine shortage of gold coins and bars thanks to this summer's frenzy. Come August and Sept., the global meltdown in stocks sparked by the collapse of Lehman Bros. then sent in a flood of new buyers. And standing in long queues outside big-city coin shops, these new buyers proved a god-send for financial journalists needing bullish copy to file. Gold was the only bull market running – and so a third wave of buyers cleared out what little inventory the coin-shops had left, sparking in turn a fresh wave of "Sold Out" signs worldwide. First the US Mint and then even the Rand Refinery in South Africa – the world's biggest gold mint – were forced to suspend shipments, unable to keep up with demand. The big online gold dealers were all out emptied too, leaving would-be coin buyers stuck with nowhere to turn. Even now, according to German-based giant Heraeus, furnaces worldwide are still booked solid to try and catch up. But with the stock market crash gathering pace yet again, demand from new buyers has only raced on again. "Production [of one-ounce retail gold coins] has dramatically increased since the middle of the year," agrees Bernhard Schnellmann, director at fellow refinery Argor-Heraeus in Switzerland, but "we cannot cope with demand." The result for Gold Coin prices? Still greater mark-ups and premiums than coin dealers usually charge. Even Krugerrand gold coins, typically the cheapest gold coins compared to the wholesale "spot" gold price, now carry a 10% or even 15% mark-up – two or three times the normal premium to their actual gold-content value – according to the Coin Dealer Newsletter. On the other side of the trade, in fact, some gold-coin owners now looking to sell report being offered more than the spot price when they go back to their dealers...just so the dealer can secure new supplies, ready to sell on to new buyers for a still wider margin. Exactly how much you pay for gold coins? That will depend on your dealer. But the disconnect from the "spot" price (or internationally recognized raw value of bullion) is clear to see. Now, at the very same moment as gold-coin demand leapt in 2008, however, the "paper gold" market of futures and options was also hit by a shock – a shock rise in financing costs. These two events were entirely related, of course, because both were sparked by the worldwide shutdown in lending. But unlike eager physical buyers looking to defend their savings with physical metal, all those hedge funds and other "large speculators" trading the Gold Price for three, six or 12 months in the future could no longer roll forward their bets. 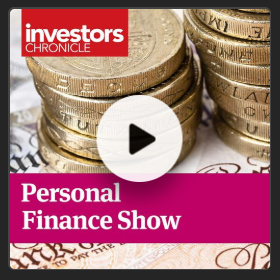 Because their brokers could no longer lend money to finance their trades. The net effect? It depressed paper-gold prices – the unsettled price of future delivery – even as retail gold prices moved sharply higher. And that's why many respected gold analysts began talking about a "disconnect" between gold futures and physical metal – a disconnect that some people believe proves a conspiracy to keep Gold Prices down via the derivatives market. Either way, "Gold is gold, paper is paper," as Alex Wallenwein of the Euro vs. Dollar & Gold Monitor writes, "and Comex gold [meaning the US Gold Futures market] is nothing but paper masquerading as gold. 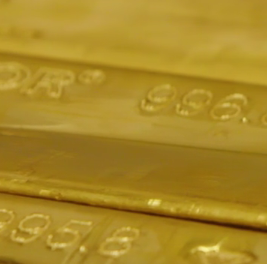 "Simultaneously [it's] pretending to be the price-setting medium for actual gold in the world. Now, finally, it is in the process of being unmasked." 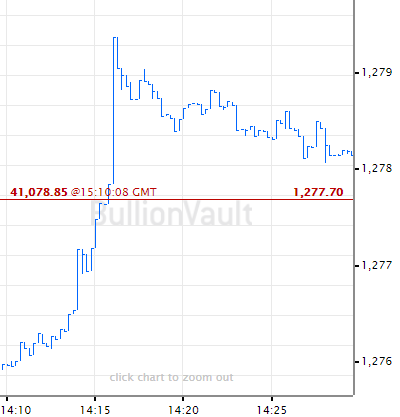 Even smart analysts trying to get a handle on the great gold disconnect missed the key point, however – the key point that sits in-between paper and coins – the huge global market in wholesale Gold Bullion Bars. This wholesale, professional market in large 400-oz bars "accounted for nearly three-quarters of gold trading and 56% of silver trading" in 2008 as new research published by IFSL here in London showed earlier this week. 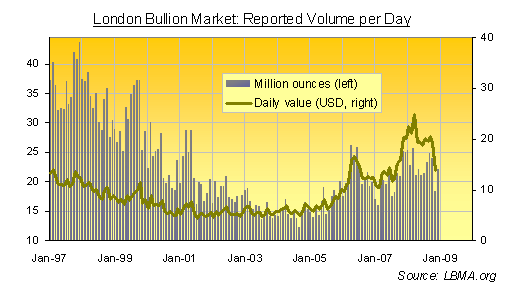 "Most of this activity was transacted through members of the LBMA (London Bullion Market Association). Daily reported net trading in gold on the LBMA averaged $20 billion in the first 11 months of 2008, up 45% on the same period last year. Daily trading in silver on the LBMA increased 32% to $2bn." 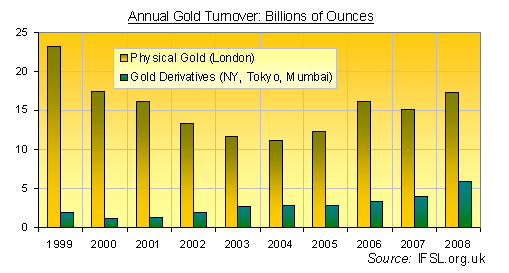 The actual volume of London's physical gold turnover, however, probably stands "three to five times the reported turnover," the consultancy notes, because transactions between LBMA members are netted out from the final, published, official data. N.B: Not all the gold dealt and delivered through London's professional brokers actually wound up sitting inside London vaults. Such deals – made over the phone, and just as unique in price as retail-sized deals at your local coin-dealer's counter – are what's known as "loco London" but may very well be settled with delivery in overseas vaults. Of course, this huge wholesale gold market is most often the source of that gold which ends up minted as coins and sold by retail dealers across the world. 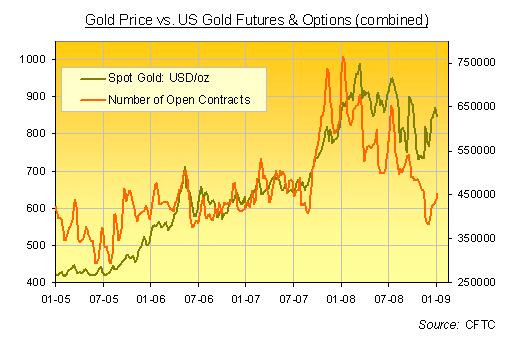 It's also subject to the forward gold prices determined by futures and option trading. Because a sharp drop in, say, the 3-month gold future will necessarily dent the "spot" price of physical gold dealt today. But the world's professional wholesale gold dealers – centered in London – really do form the daddy of gold bullion markets. London's gold dealers turned over something between $60 billion and $100 billion of gold in 2008...each and every day on average! Yes, that's peanuts next to stock, bond or forex markets. But any "analysis" of gold prices which jumps straight from coins to future surely misses the point. 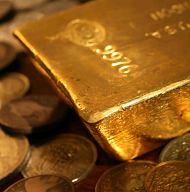 The "truth" about gold prices today is that, whatever form it comes in – whether as coins, paper or digital contracts, or large wholesale bullion bars – the price it's worth is the price at which you and another willing party agree to deal. So gold coin buyers on e-Bay no more represent the "true" price of gold anymore than a digital or paper contract traded for delivery 12 months from today – a contract that will most likely end with cash settlement, in fact, rather than delivery of any physical metal. If you'd rather know the "real" price of gold as judged by the huge London gold market – a market worth upwards of $60bn per day – then check the price that London dealers are quoting for gold held as large 400-oz bars. And if you want to deal at the very best prices, in the world's very deepest and most liquid gold market, then stop paying retail and start trading wholesale Gold Bullion instead.